Kentico CMS (newest version Kentico 8.1) is a web content management system that allows you to easily manage your website content without technical knowledge. If you need to add some text, images or products to your website, you can do that through a browser-based user interface without the need to call web designers. Kentico 8.1 CMS goes beyond content management and offers many additional modules that allow you to create online forms, send email newsletters, sell products online, build customer communities and many others. 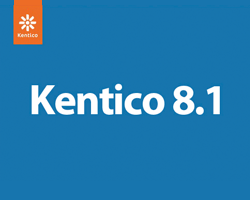 Kentico 8.1 CMS is an affordable content management solution that provides a complete and total set of features for building web sites, intranets ,community sites and also on-line stores on the Microsoft ASP.NET platform. Sign up for our UK Kentico 8.1 Hosting with no risk to try our excellent service start from £2.99/month! ASPHostDirectory.com offers cheap Kentico 8.1 Hosting to all our new and existing UK customers. You can try our services before buy it. Get FREE 7 days Trial Hosting with us. There's no obligation to buy — you can upgrade to a more robust account or cancel at any time. No risk anymore, why wait longer?